A contingency table is a table of counts by categories. This Demonstration uses a twoÃ¢ÂÂway table with the categories "choice" and "group". The Counts table represents actual counts and the four additional tables give the expected counts for four models for the data. For each model the total count for the table is the same. 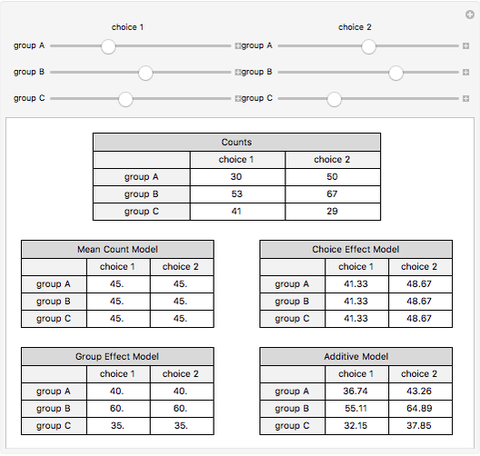 The choice effect model fits the case where the count differs across choice, but is constant across group. The total predicted counts by choice are the same as for the original data, but the totals by group are not the same in general. The group effect model fits the case where the count differs across group, but is constant across choice. The total predicted counts by group match those for the original data, but the totals by choice do not in general. The additive model fits the case where choice and group have an additive effect on the predicted counts. 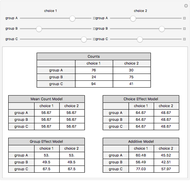 In this model, the total predicted counts by choice and the total predicted counts by group match those for the original data. Use the sliders to adjust the original counts and see how the four predicted tables change. The underlying model is a logÃ¢ÂÂlinear Poisson model. The categories are treated as nominal predictor variables and there is no interaction between the predictor variables in the four models shown. Darren Glosemeyer "Comparing Models for Two-Way Contingency Tables"